Explore the best of Tasmania’s stunning coastline from Hobart to Bruny Island with a day out on the water aboard comfortable cruise vessel Odalisque. Savour local products right from the source – from cheese to whisky, abalone to oysters. Enjoy the stunning scenery – towering cliffs, pristine bays, blue ocean, white beaches. Meet some of the locals – oyster farmers, cheese makers, fisherman and chefs. Discover the real Tasmania on this tailored cruise experience. 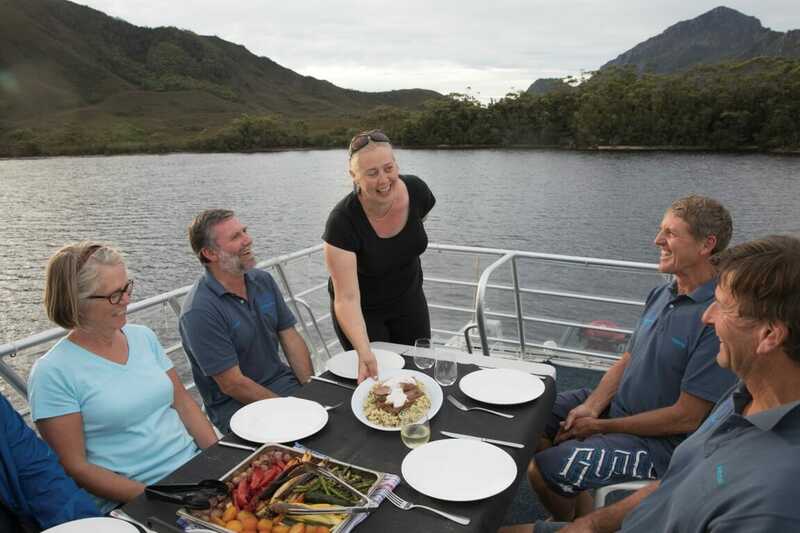 Relax aboard your comfortable cruise vessel, soak up the stunning scenery and enjoy fine wine and gourmet Tasmanian fare. Head ashore to explore in one of our tenders. How we spend your day cruising to Bruny Island and exploring ashore is completely up to you. Feast on a gourmet Tasmanian lunch prepared for you by our onboard chef, accompanied with a selection of top-notch Tasmanian wine & beer. Contact us today to put together your custom cruise itinerary. Learn more about our vessel, Odalisque, custom-built so that you explore in comfort, whatever the weather! Perfect for small groups. To get the most from your day, we generally recommend a 9am start from a location convenient to you. Your cruise can start from most central Hobart waterfront locations, including the Salamanca area. The cruise from Hobart to Bruny Island takes approximately two hours aboard our custom-built vessel Odalisque. On the way, we’ll travel past some amazing scenery, including the Alum cliffs near Taroona and many small islands lining the channel. We’ll have a good chance of spotting some local wildlife including dolphins, seals, penguins and sea eagles. We estimate that the experience will end at approximately 5pm (although we can tailor the length and end times as you prefer and depending on which activities are included). Cruises start from $6,600 plus $150 per person. To put together your custom cruise itinerary, please get in touch with us today.